Each year, the NFOIC convenes the Freedom of Information Summit. 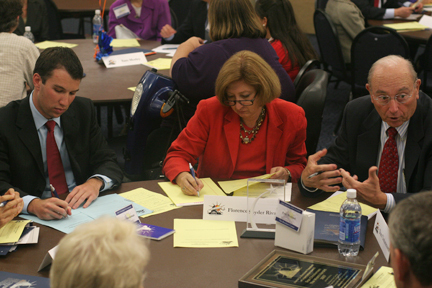 The FOI Summit features the exchange of ideas, experiences and discussions about the latest issues and trends around freedom of information laws, policies and practices at the state and local levels across the U.S. The summit delivers two days of panel discussions, presentations, and group interaction featuring experts, advocates and champions of transparency and open government. A great networking event for state affiliates and all members, included in the summit is the keynote luncheon highlighted by the induction of a worthy individual into the State Open Government Hall of Fame, a tradition NFOIC launched in collaboration with the Society of Professional Journalists more than a decade ago. Music City USA becomes home for NFOIC, state FOI coalitions and open government advocates for the 2017 FOI Summit on Friday and Saturday, October 13-14, 2017. The National Freedom of Information Coalition (NFOIC) and our host, the Tennessee Coalition for Open Government will convene the annual summit at the First Amendment Center at Vanderbilt University. The nation’s capital and the 50th anniversary of the signing of the Freedom of Information Act serve as backdrops for the 2016 FOI Summit. The National Freedom of Information Coalition (NFOIC) and co-sponsor the D.C. Open Government Coalition (DCOGC) will convene the summit on Friday and Saturday, October 7-8, 2016 at the Dupont Circle Hotel in downtown Washington, D.C.
NFOIC and co-sponsor Colorado Freedom of Information Coalition convened the 2015 FOI Summit on Friday, October 9th, and Saturday, October 10th in downtown Denver, Colorado. The FOI Summit features ideas, experiences and discussions about the latest issues and trends around freedom of information laws, policies and practices at the state and local levels across the nation. The National Freedom of Information Coalition and the Florida First Amendment Foundation are pleased to bring you the 2014 FOI Summit Thursday, October 23 and Friday, October 24, from the Poynter Institute for Media Studies in beautiful St. Petersburg, Florida. Tom Blanton, the director of the National Security Archive at George Washington University is the keynote speaker, and there will be a rich selection of panels, both to help on managing coalition issues and on the events that are impacting local, state and federal transparency laws and policies. Columbia, MO and New Orleans, LA — The National Freedom of Information Coalition and the Public Affairs Research Council of Louisiana bring you the 2013 FOI Summit on Friday, May 17, and Saturday, May 18, from the Renaissance Arts Hotel in New Orleans, Louisiana. Columbia, MO and Madison, WI — The National Freedom of Information Coalition (NFOIC) announced that it will join the Wisconsin Freedom of Information Council (WFOIC) in hosting the 2012 FOI Summit in Madison, WI, May 11 - 12. The annual FOI Summit, a national conference held in collaboration with the Society of Professional Journalists (SPJ), will be at the Madison Concourse Hotel and Governor's Club in downtown Madison. The National Freedom of Information Coalition and the New England First Amendment Coalition were pleased to bring you the 2011 FOI Summit Friday, May 20, and Saturday, May 21, from the Providence Biltmore in Providence, Rhode Island. While you're at it, be sure to check out the inaugural Dale R. Spencer Freedom Talk as part of this year's Summit keynote address. The National Freedom of Information Coalition and the Virginia Coalition for Open Government bring you the 2010 FOI Summit on Friday, May 7, and Saturday, May 8, from the Hyatt Arlington in Arlington, Virginia. The National Freedom of Information Coalition and the Minnesota Coalition on Government Information bring you the 2009 FOI Summit from Minneapolis, Minnesota, on June 5 and 6. We'll look to the North Star State to help give us direction in our continuing battle to secure open government and government accountability. The National Freedom of Information Coalition and the Pennsylvania Freedom of Information Coalition bring you the 2008 FOI Summit from Philadelphia, Pennsylvania. Let freedom of information ring! serves as an apt slogan for this year's conference, but for that slogan to reflect reality an active and informed citizenry is required. The FOI Summit helps promote that, and your participation is vital. The National Freedom of Information Coalition and the Washington Coalition for Open Government (WCOG) announce Seattle Sunshine: 2007 FOI Summit. This year's Freedom of Information summit in Seattle, Washington, is your best opportunity to get a clear view of the state of state FOI. The conference brings together access advocates from all over the country to share ideas, highlight successes, and head off the latest tricks in the secrecy trade. The 2006 Freedom of Information Summit in Indianapolis drew nearly 200 participants. More than 40 speakers were featured at the event. Former New Jersey lawmaker Byron M. Baer also was inducted into the Open Government Hall of Fame. All membership dues and donations are tax-deductible.